AMARONE DELLA VALPOLICELLA A full-bodied, chocolate and raisin-scented wine made from dried grapes. The same varieties – Corvina, Rondinella and Molinara – are used to make Valpolicella in northern Italy. Grapes are laid out to dry for several months, then fermented dry and aged in oak, yielding high alcohol dense wines. Modern styles have an intense sweet cherry and chocolate cake flavour with incredible richness, making it ideal for hearty Korean barbecues. BRUNELLO DI MONTALCINO This is a superior clone of Sangiovese developed in the Montalcino region of Tuscany and is never blended with other varieties. It produces some of the finest and most complex Italian red wines and by law, it can only be released into the market in its fourth year with two years in cask. These are serious wines with long aging potential and its savoury flavours work well with umami-laden savoury stews from Japan or Korea. BARBARESCO A floral-scented aromatic wine made from Nebbiolo grapes produced around the village of Barbaresco in Piedmont, northwest Italy. It is similar to Barolo, but with less concentration and lower levels of tannin and acidity. It is generally a fruitier and rounder wine than Barolo as it is aged for a shorter period of time in oak before bottling. The firm tannins make it wonderful for pairing with skewered meat like satay. BARBERA A versatile red grape variety from Piedmont, Italy, with a deep ruby colour and full-bodied berry fruit. It used to be made as a cheap and cheerful style but serious wines are able to replicate the density and concentrated fruit character of Nebbiolo-based wines with lively acidity and fairly firm tannins. Still, it is a less serious wine than Barolo and many are ready to be enjoyed fairly young with hearty, meat-based Asian dishes. BAROLO Takes its name from the village ‘Barolo’ in Piedmont, northwest Italy and is the most concentrated style of wine produced from the Nebbiolo grape and considered to be one of Italy’s finest red wines. Barolos have very distinctive aromatics of rose petals, violets and tar. The pale colour can be misleading since Barolos are highly tannic and powerful with high concentration of fruit, alcohol and acidity. The aging potential of the best examples are at par with those from the top Bordeaux châteaux. Mature Barolos are wonderful accompaniments to many meat-based Shanghainese and northern Chinese dishes. BRUNELLO DI MONTALCINO This is a superior clone of Sangiovese developed in the Montalcino region of Tuscany and is never blended with other varieties. It produces some of the finest and most complex Italian red wines and by law, it can only be released into the market in its fourth year with two years in cask. These are serious wines with long aging potential and its savoury flavours work well with umami-laden savoury stews from Japan or Korea. CABERNET SAUVIGNON The world’s most renowned red grape variety that grows well in many climates but ideally suited for temperate rather than very hot or cool regions. The small berry size and thick skins produce wines that are dense, full-bodied, tannic and capable of producing wines of great richness, concentration and longevity. However, even when fully ripe, the variety can have distinctively vegetal or herbaceous undertones. It is often found blended or as a single varietal and some of the most classic examples have rich concentrated black currant notes and are found in Bordeaux, Napa Valley and Coonawarra. This variety is challenging to pair with many Asian cuisines because of its high tannins, however, mature wines are wonderful matches and much more versatile. CABERNET FRANC This variety is often in the shadows of its more famous blending partner, Cabernet Sauvignon. The variety shares similar herbaceous undertones with Cabernet Sauvignon but often lacks the depth and rarely has the concentration – notable exceptions are in Saint-Emilion and in wines such as Cheval Blanc. In the Loire Valley, the wines are medium-bodied with blackberry fruit and a distinctive pencil-shaving character. As a single varietal wine, it is difficult to pair with Asian dishes but when blended, it pairs well with fatty pork dishes from Korea and northern China. CHIANTI CLASSICO A region in Tuscany producing wines from Sangiovese often blended with other Italian varieties and international red varieties. The wines are generally medium-bodied with sour cherry, earthy notes and the best examples such as the Riserva are aged for at least two years prior to being released in the market. Examples of Chianti Classico that are not too tannic can be good accompaniments to dishes that may seem challenging such as hot pots and sukiyaki. DOLCETTO An early ripening Italian variety which is almost exclusive to northwest Piedmont and predominantly bottled as a single varietal. It produces soft, round, fruity wines with aromas of licorice and dark cherry and has a deep purple hue. These early consuming wines are good everyday options for simple Indian or Korean meals. GAMAY A red French variety predominantly planted in Beaujolais, France. Gamay produces wines of relatively low alcohol, high acidity with a simple aroma of freshly picked red fruits. Its high acidity, light body and refreshing style makes this an extremely versatile, underappreciated wine to pair with many Asian meals. It is perfect for simple Japanese everyday food such as donburi as well as casual southeast Asian meals. GRENACHE A drought-and-heat-resistant variety widely planted in Spain and southern France. It yields fruity, spicy wines with medium body and fairly low tannins. Highly irrigated vines produce pale innocuous wines but producers in Châteauneuf-du-Pape, France, or in Priorat, Spain, prove that Grenache-based wines can be serious, age-worthy reds. Most Grenache-based wines such as simple Côtes du Rhône are ideal, safe red wine options that can complement a range of flavours in numerous Asian cuisines including Cantonese, Japanese, Shanghainese, Thai, Singaporean and Korean. ITALIAN IGT WINE IGT stands for Indicazione Geografica Tipica, a classification introduced in 1992 for Italian wines that used different varieties or opted for wine-making decisions that were not in keeping with the DOC and DOCG system. These wines often commanded higher prices and were aimed for an international audience. Typically, IGT reds are bolder, more fruit forward than traditional versions and have a strong new oak influence. Unfortunately, these tannic, high alcohol styles are not as compatible with many Asian dishes as their traditional counterparts. MALBEC In France, this variety has declined in popularity but has proved to be successful in Argentina. The best examples display rich, ripe blackberry fruit character with hints of violet and are capable of extended cellaring. The chewy, high tannins make this a challenging variety to pair with Asian dishes but can work with stewed meat dishes from India or Korea. MERLOT One of Bordeaux’s great black grape varieties providing softness and rounding out the tough tannins of its frequent blending partner, Cabernet Sauvignon. The best examples are found on the right bank of Bordeaux and the wines can be just as dense, concentrated and capable of long-aging as those from Cabernet Sauvignon-dominant wines. Generally, Merlot has plumy, approachable fruit with velvety textured tannins. These characters make it a wonderful accompaniment to flavourful Asian dishes such as yakitori, roasted meats and beef satays because the rounded tannins do not clash with the spices and salt content in the dish. MONTEPULCIANO A widely planted red variety named after the town of Montepulciano in Tuscany. This late-ripening variety produces full-bodied red wines, notably in Abruzzo, with modest acidity and tannins. Generally, the wines are made for early drinking and are simple, affordable accompaniments to hearty meals. MOURVÈDRE This late-ripening black variety is popular across the south of France and Spain where it is most commonly found in blended reds. It provides the colour and tannin structure for wines blended with Grenache, Syrah and Cinsault. Regions such as Bandol in Provence do produce Mourvèdre-based wines but the quantities are small and the powerful tannins make it challenging to pair with Asian dishes. NEBBIOLO This great black variety is native to northern Italy’s Piedmont region where it produces fine, aromatic and complex Barolos and Barbarescos capable of long aging. The thin skins and fickle nature of this variety make it an extremely challenging variety to handle and ripen reliably. However, the best examples have great concentration, complex aromatics and capacity to age for decades. Mature Nebbiolo pair beautifully with numerous game and poultry dishes such as roasted squab, duck and goose. Please see Barolo and Barbaresco. NEGROAMARO This is an indigenous dark-skinned southern Italian variety available both as a single variety and as a blend. Widely found in Puglia and most often enjoyed as a robust full-bodied wine with simple meat dishes. PINOTAGE Pinotage is a crossing between Pinot Noir and Cinsault and is mostly closely associated with South Africa. The best examples from carefully managed yields are full-bodied, meaty with a wild red berry character. Some examples can have a smokey, burnt flavour with volatile aromas. The gamey and spicy character makes it appropriate for red meat dishes, but avoid those from the hot inland regions which can have excessive alcohol. PINOT NOIR A fickle, thin-skinned variety that has beckoned growers to meet its demanding needs to produce ethereal wines with finesse and elegance. Pinot Noir requires painstaking attention to detail from both the grower and winemaker. The variety requires cool climates with sufficient sunshine to enable the grapes to ripen slowly and develop ripe raspberry and strawberry-scented wines. Complex examples have multiple fruit layers including hints of earth, mushroom, undergrowth and game, despite its light body and elegant character. The very best examples are found in Burgundy but many cool sites in the New World are beginning to produce fantastic Pinot Noirs. Well-made Pinot Noir is versatile, refreshing and elegant – the perfect red wine partner for many Asian meals. This is my first choice for nearly all my Asian meals, whether it is Korean, Chinese, Japanese or Thai. SANGIOVESE This is the principal black grape variety for quality wine in Tuscany, producing wines such as Chianti, Brunello di Montalcino and Super Tuscan blends. Simple examples are medium-bodied with sour cherry fruit but the very best examples have complex fruit characters with greater density and capability to cellar for years. The simple examples are wonderful with a wide range of everyday one-bowl rice or noodle meals while the serious versions pair well with roasted meats, especially roast pork and duck. Please see Chianti Classico and Brunello di Montalcino. SUPER TUSCANS This term refers to high-profile Tuscan red wines produced outside the traditional Italian classification system (DOC and DOCG). Often, international varieties are used and can be blended with indigenous varieties such as Sangiovese. This style was spearheaded in the 1960s by Antinori whose pioneering wine, Sassicaia, brought both international attention and high prices to the west coast region of Italy. Please see Italian IGT Wine. SYRAH / SHIRAZ Fine examples of this variety can render rich, complex and distinctive wines. It is the major variety in northern Rhône, France, and produces distinctively spicy, complex, full-bodied red wines. Classic descriptors include pepper, spice, leather and gamey flavours and Asian descriptors would include roast goose, char siu meat, garam masala and Chinese five spice. Prime examples are Côte-Rotie and Hermitage. It is also the dominant Australian red wine variety, producing collectibles such as Grange and Hill of Grace. The variety grows well in a fairly wide range of climates and terroirs and is commonly found as both a single varietal wine as well as part of a blend. Wonderful with hearty, flavourful Indian meals and many Southeast Asian meat-based dishes. TEMPRANILLO An indigenous variety widely planted in northern Spain, capable of producing a wide range of styles from simple strawberry and vanilla-scented wines to rich, concentrated wines capable of long aging. Lighter versions are medium-bodied with moderate alcohol and tannin levels. The denser versions are full-bodied with chewy firm tannins and dark berry fruit. Tempranillo is well suited to long oak maturation and the hallmark for traditional Rioja is the sweet, coconut-scented American barrels. The cooler appellation of Ribera del Duero produces Tempranillos with incredible concentration and intensity. Simple Tempranillo-based wines are great everyday accompaniments to Asian snack foods such as poh piah and gimbap (Korean rice rolls). VALPOLICELLA A region in Veneto, northeast Italy, producing wines using a blend of three varieties – Corvina, Rondinella and Molinara. Basic Valpolicella is light, fruity and made to be consumed young. Serious versions have denser red cherry fruit characters and firmer tannins; however, very few Valpolicella is made for cellaring. Amarone della Valpolicella uses the same three varieties but grapes are dried prior to fermentation . Valpolicella, with fairly low tannins and fruity character, is an extremely versatile wine and works well with a range of Asian dishes including pan-fried and even spicy Sichuan dishes. 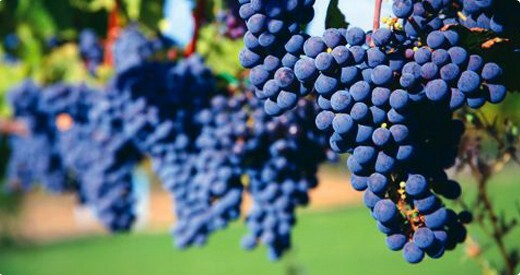 ZINFANDEL / PRIMITIVO Zinfandel is most closely associated with California and its reputation ranges from off-dry inexpensive blush wine to serious full-bodied dry red wines capable of aging. In Italy, it is known as Primitivo and found in the southernmost regions such as Puglia. As a full-bodied dry red wine, Zinfandel / Primitivo has ripe strawberry fruit characters and very high alcohol. The intensely fruity character combined with high alcohol makes it difficult to pair with many Asian dishes. However, it works well with robust stews and roasted meats. ALBARINO / ALVARINHO Known as Albarino in Spain and Alvarinho in Portugal. The wines are light in body, high in acidity and express a green apple or citrus character in the cooler climate of Vinho Verde, Portugal but a distinctive perfume and peachy aroma similar to Viognier in the warmer region of Rías Baxis, Spain. Sometimes, a slight prickle can be detected in young wines, adding to their refreshing character. Albarino is a good accompaniment to seafood and many Cantonese dishes. CHARDONNAY A white grape variety that is a true chameleon, producing a wide range of quality wine styles under diverse climatic variations. Cool climate styles produce crisp wines with high acidity and slightly green undertones whereas the fruit character in warmer climates is more exotic, ranging from stone fruit expressions to ripe, tropical fruits. Body and alcohol levels vary just as much – from lean light-bodied wines to high alcohol full-bodied styles. Chardonnay is equally versatile in the winery and many winemaking techniques can change the style from barrel fermentation to lees stirring and oak aging. Chardonnay can be found in nearly all the major wine growing regions and countries in the world. CHENIN BLANC This white grape variety has crisp acidity with fruit expressions that range from citrus fruits to crisp apples. Styles can range from dry innocuous whites to complex minerally off-dry styles and sweet wines capable of long aging. Many of the plantings in South Africa and California produce simple wines for early consumption while some of the best examples come from the Loire Valley in France, with the potential to age for many years. High acidity makes it perfect with creamy white sauces and even spicy food. FUMÉ BLANC Sauvignon Blanc was renamed Fumé Blanc in California by Robert Mondavi in the 1970s and oak maturation became the standard for wines bearing this name. Barrel fermentation and subsequent oak maturation can give these typically lean wines more body. Occasionally, Semillon may be added to the blend. These wines are perfect accompaniments to a wide range of medium-weight Asian dishes because they have sufficient acidity, body and depth to stand up to strong flavours. Please see Sauvignon Blanc. GEWURZTRAMINER A distinctively, spicy and intensely aromatic full-flavoured variety. The best dry and sweet examples are found in Alsace, France where the climate allows the grapes to ripen slowly, keeping the intense aromas balanced to produce complex wines. Good examples are also found in northern Italy and in the cooler regions of central Europe. Not an incredibly versatile wine but it works well with cuisines that have strong aromatics, spices and sweetness in their cooking such as Thai food. GRÜNER VELTLINER The most widely planted white grape variety in Austria is also found elsewhere in Europe. The best examples develop Grand Cru Chablis-like characteristics with age but generally, it produces wines with a light aroma of white pepper and citrus which, combined with the high acidity, makes for a great accompaniment to food. A very versatile wine that is great for dim sum, tempura and a wide range of pan-fried dishes. MARSANNE This is a very productive varietal producing full-bodied wines, high in alcohol with a marzipan, dried herbs and sometimes floral character. Its plantings now outweigh those of Roussanne which is a frequent blending partner in northern Rhône. Marsanne is known as one of the major white varieties in the Rhône. Although it has yet to gain popularity in Asia, the savoury, herbal characters and full body are ideal for a wide range of Korean and Taiwanese dishes. MUSCAT Muscat has numerous clones and variations but all of the expressions share an intensely grapey aroma. Excellent examples of dry styles are found in Alsace while sweet styles, both fortified and unfortified, are planted in warmer Mediterranean climates. The simplest wine styles are light-bodied and filled with grapey, peach and floral aromas and are best consumed young. Sweet styles can be fortified and the best examples are found in southern France. These sweet wines are excellent with sticky rice cakes filled with sweet yellow bean or sesame paste. MUSCADET A reliable neutral white wine that is wonderful with oysters as well as sashimi. The best examples are left on their lees for the winter months to give the wines an extra dimension and rounded mid-palate. The Muscadet region lies at the western end of the Loire Valley in France. PINOT BLANC / PINOT BIANCO (ITALY) A widely planted variety in Italy, Alsace, Germany and Austria. In Austria and Italy, sparkling and still wines are often light and refreshing in character. Its fuller-bodied examples can be quite similar in character to Chardonnay and are versatile, great food wines. Sweet styles can also be made such as those from Austria – Trockenbeerenauslese made from botrytised Pinot Blanc grapes. PINOT GRIS / PINOT GRIGIO (ITALY) A white variety producing fresh, crisp and lightly perfumed northern Italian white wines which are often undistinguished. However, the best examples exhibit herbal and citrus characters and can be intense, rich and full-bodied such as those found in Alsace, France. The hint of spices in the richer styles helps bring out the spices in Indian cuisine. RIESLING An aromatic variety with inherently high acidity. In cooler climates, it expresses floral notes and citrus and apple fruit characters. In warmer climates, the lime becomes more prominent and passion fruit and stone fruit aromas can also be found. Rieslings are considered one of the most transparent varieties since the best examples have a crystal clear way of expressing their origins, especially their climate and soil. A wide range of styles are found mainly in cool climate regions in Germany, Austria, Alsace, New Zealand and Australia. Styles range from dry, lean, rich and full to off-dry and sweet. Its crisp acidity and versatility make Riesling one of the most dependable accompaniments to a wide range of Asian dishes. ROUSSANNE Improved clones of Roussanne have encouraged plantings in the south of France and California because it is capable of producing wines of high quality and finesse with ability to age. The wines have very distinctive character reminiscent of herbal tea which adds aromatics to Marsanne / Roussanne blends frequently found in northern Rhône. SAUVIGNON BLANC A hugely popular international variety widely planted in Bordeaux, Loire and New Zealand producing crisp and refreshing herbaceous wines. It can be fresh, light and crisp or full-bodied, barrel-fermented and matured. The former examples are often from cool climates and are wonderful with the range of seafood dishes from Mumbai to Tokyo. Fuller-bodied styles are denser and can express characters of flint and chalk such as the wines from Pouilly-Fumé in Loire Valley, France. In Bordeaux, Sauvignon Blanc is often blended with Semillon and produces food-friendly wines that have the weight as well as the acidity to match numerous white meat dishes such as Sichuan-style chicken or Thai-style pork with basil. SEMILLON This variety is rarely found on its own except in Australia. It has a slightly oily texture, a waxy fruit character that can be confused with Chardonnay and is capable of producing top quality dry and sweet wine. In the Hunter Valley, the early harvest Semillons are lovely wines with the ability to age for decades. When blended with Sauvignon Blanc, it adds roundness and body as well as extra depth such as with Bordeaux dry whites. As a late-harvest wine, it is capable of yielding amazingly complex and richly flavoured wines and the best examples come from Sauternes, Bordeaux. SOAVE A widely recognised wine produced in Veneto, northeast Italy. It is made from Garganega and can contain a small proportion of Chardonnay in the blend. Most Soaves are light and refreshing with a delicate dried herb and nutty aroma. This is a lovely and versatile wine that is easy to enjoy. TREBBIANO / UGNI BLANC (FRANCE) Trebbiano is widely planted across Italy except for the far north where the climate is too cool for the grapes to fully ripen. Given its rather bland character, it is nearly always blended with other indigenous varieties with more interesting aromas such as Grechetto, Malvasia and Verdello. There strained neutral fruit characters are actually a benefit to many Asian dishes where wine is required as just a backdrop accompaniment to a spicy flavourful meal. VERDEJO The traditional grape of Rueda, Spain, it produces lightly aromatic, elegant and refreshingly fruity wines. It is often blended with Sauvignon Blanc and echoes its crisp acid, light-bodied style. Like its blending partner, Verdejo is a versatile variety and a great partner to many seafood dishes, even spicy ones like black pepper crab from Singapore. VERDICCHIO One of Italy’s classic varieties produced in two DOC Zones, Verdicchio di Matelica and Verdicchio dei Castelli di Jesi near the Adriatic Sea, which further explains its ideal accompaniment to seafood. Styles can range from light and refreshing to fuller, more aromatic styles. Another food wine that works well with a very wide range of dishes. VERMENTINO This variety is widely planted in Sardinia and to a lesser extent, Liguria; examples can also be found in Languedoc-Roussillon in the south of France. In Sardinia, the grapes are picked early to retain good acidity levels producing fresh, crisp wines. Recently, fuller styles have started to emerge in the market but they are still limited. VIOGNIER The finest examples of this full-bodied, aromatic variety can be found in northern Rhône, expressing a delicate floral perfume, peach fruit notes, mineral characteristics and a silky texture. It is a relatively difficult grape to grow as it quickly develops high sugar levels which can result in unbalanced alcoholic wines. The best examples are silky textured, full-bodied, filled with the scent of flowers and have a persistent finish. The leaner styles with minerality and fresh acidity are wonderful accompaniments to Thai and Vietnamese dishes. VIURA This is northern Spain’s most planted white grape variety, known as Viura in Rioja and Macabeo in Catalunya. In the latter area, it is often used for making sparkling wine, Cava. In Rioja, it is often aged in oak, producing a medium-bodied wine, ideal for food. While other regions such as France have plantings, it is not as significant as in northern Spain.